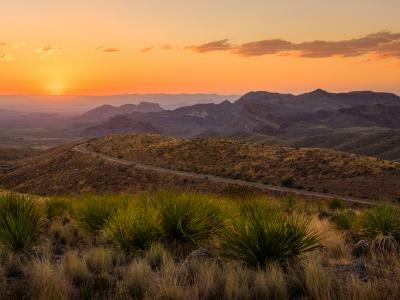 Flowering plants first appeared on Earth roughly 160 million years ago, but only in the past century or so has Texas perfected them. The easternmost parts of the state feature epically lavish gardens. We traipsed through the Piney Woods to admire roses of all hues and unreal fields of daffodils. The Piney Woods’ botanical excellence doesn’t stop with cypress trees. 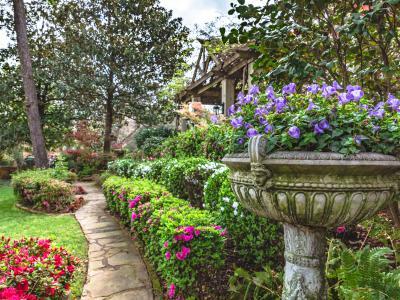 The East Texas region boasts some of the world’s most ravishing gardens. Some arise seemingly out of nowhere, surprising passing drivers, while others are beloved centers of civic pride. In either case, we stopped to smell the angiosperms. In Tyler, a rose is still a rose—and that’s a good thing. In fact, it couldn’t be better. It’s estimated that three out of every four roses bought in the United States annually are processed in Tyler, which has thrived on the rose trade since the 1920s. The symbolic nucleus of that civic passion? The Tyler Municipal Rose Garden, a 14-acre park featuring 38,000 bushes in more than 600 different varieties. It’s the nation’s largest rose garden, particularly splendid in the spring and in October, when every bud is in bloom. We paid a visit in mid-October, during the 81st annual Texas Rose Festival. A citywide celebration of the local rose industry, the fest draws hundreds of devotees and offers a packed schedule of events. We admired the pageantry of the Queen’s Coronation, waved to 120-plus entries in the annual parade, and marveled at the lavish arrangements of the Rose Show. During one event, the Queen’s Tea, we managed to fully explore the garden, where walkways led us through hedge after hedge of blossoms in every hue naturally possible: lavender, red, pink, orange, yellow, white, and more. With a quaint fountain here and a pastoral pavilion there, the layout is like something from a palatial estate. But it’s the horticulture that truly wows. Throughout our walk, we gladly took in the aromas, especially in a 300-bush section donated by esteemed breeder David Austin. His perennials, which come in various colors and petal formations, were an olfactory delight. The garden is open seven days a week year-round, from sunrise to sundown, and admission is free. 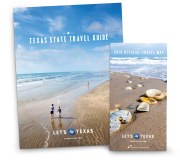 If ever you’re in the East Texas town of Gladewater during February or March, do yourself a favor: Drive 13 minutes south on U.S. Route 270, make a left on Smith County Road 3104, and a right on Smith County Road 3103. Soon you’ll find yourself amid millions—yes, millions—of daffodils in full bloom. These are the Helen Lee Estate Daffodil Gardens, a 28-acre stretch of green hills dotted with brilliant flecks of yellow as far as the eye can see. We drove the four-mile trail that is accessible to visitors on the privately owned tract and can attest to its magnificence. Managed by Carolyn Owens Johnson, the 918-acre property was once owned by the eponymous Mrs. Lee, who further beautified the land after her husband’s death in 1954. Driving along the path, we enjoyed the fruits of Lee’s labor of love. While we mostly admired the scenery from the road, we did stop at odd intervals to take snapshots. Lee built a full-scale wooden replica of a pioneer cabin that makes a perfect photo background, and we took good advantage of the opportunity. Rounded out by a man-made pond and lake, the place is a hidden gem, one that draws admirers from all over. Between 2,500 and 6,000 visitors are expected each year, and the registry shows guests from as far away as South America, Europe, and New Zealand. The garden is open seven days a week, 10 a.m. to 4 p.m., from mid-February through the end of March or until the daffodils cease blooming. Entrance is free, but donations are accepted. And in case it needs to be said: Don’t step on, sit on, or pick the flowers. At Tyler Municipal Rose Garden, new varieties are tested for disease resistance, flowering, and vigor. The garden, one of 24 All-America Rose Selections test sites, helps determine which kinds get released to the public.